Pier Park water misters have arrived! The three promised water “misters” have arrived at Westminster Pier Park, right on schedule. The misters are positioned right next to the hammocks and the beach volleyball courts, and according to contributor Eryne Donahue (who took the photos featured below), they do help to make a hot afternoon tolerable. The Pier Park is the newest and most strikingly attractive park in New West. But the heat wave this summer has highlighted a problem: most of the park is in full sun, all day long. It is just too hot to spend much time in when the temperature climbs. The misters will provide some needed relief. Cooling misters have been installed next to the hammocks and beach volleyball court at Westminster Pier Park. Photo: Eryne Donahue. “Misters” are coming to Westminster Pier Park in July to help park-goers beat the heat. Photo: Eryne Donahue. The City of New Westminster is getting ready to install three cooling misters at Westminster Pier Park on the Timber Wharf near the volleyball court and hammocks. While Pier Park is a gem on the waterfront, in the summer, the heat is intense, with little shade to be found. Summer heat came early with a May that was one of the driest on record, and it’s only getting hotter. 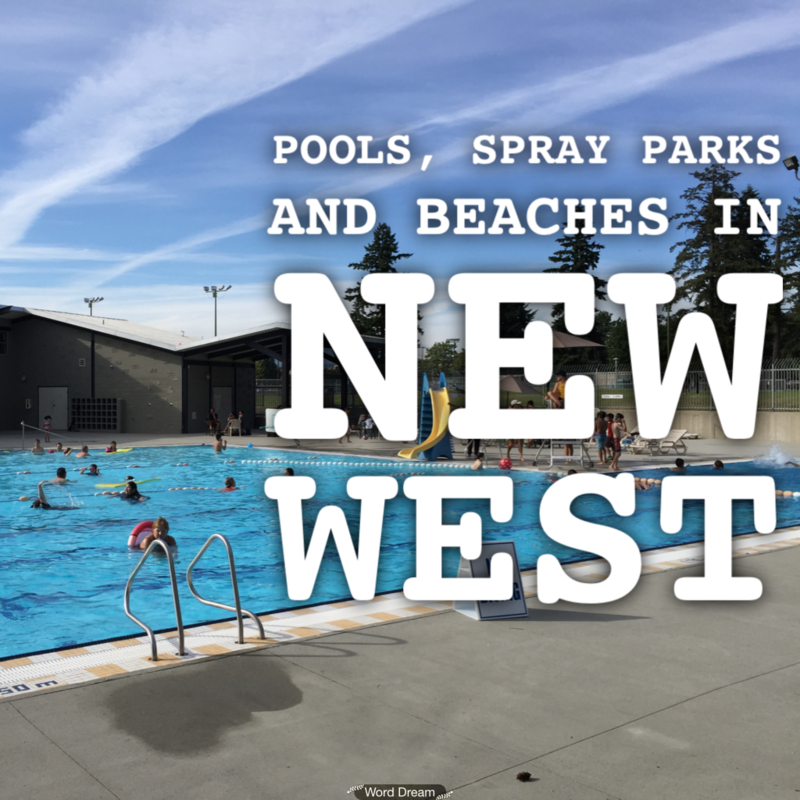 Thankfully, New West has a pretty great list of spray parks, splash pools and even a couple beaches where you can suntan on hot sand. Queens Park – A classic spot for summer fun, the thick trees of the park make it easy to find a shady spot to cool down. The spray park features a water table feature for toddlers as well as a varied collection of sprinklers for older kids and adventurous tots to run through. The spray park is next to the Queens Park Petting Zoo (open 10am-5:30pm), a concession, and the Rainbow Playland playgrounds. Moody Park – Located Uptown at 6th Ave. & 8th St. next to the playground, this older spray park is earmarked for an facelift soon. Water lines were recently upgraded in preparation for the new spray park. I’m not sure when the new spray park is due to be installed, but this could be the last summer to enjoy the tree-stump sprinklers in the old park. Ryall Park – Next to a toddler playground, an all-wheel park, and the Queensborough Community Centre. The community centre includes a small branch of the New Westminster Library – a good spot to step out of the sun for a while to check out a book or do a puzzle with your kids. Sapperton Park – Blessedly close to Starbucks and a short walk from Sapperton SkyTrain, this smaller spray park at Sherbrooke & East Columbia is a great spot to meet up with friends. I often find at larger parks like Queen’s, the kids run off to play in different areas. It’s hard to keep up a conversation while you’re chasing them to opposite ends of the playground! At Sapperton Park, the kids are always within eyesight, which makes it easy for the parents to enjoy their “playdate” too. Old Schoolhouse Park – Not a true spray park, but this Queensborough park includes a playable water feature for kids where they can get as wet as they want to. At Ewen Ave & Derwent Way. Hume Park – Resurfaced in May/June 2015, this is now open for business! Really nice re-do of the splash park, that uses recycled tires for the surface – non-slip and a bit squishy on the feet. Located off East Columbia Street in Sapperton. Moody Park – The newest pool in New West is conveniently located in leafy Moody Park. Changerooms are clean and spacious, and while the pool isn’t the biggest around, it is a beautiful spot to cool off in summer. Open for public swim from 1:15 to 7:55pm in July & August. Adult swim from 8-9:25pm on Tuesdays & Thursdays; youth swim from 8-9:25pm on Wednesdays. Hume Park – Pair your swim with a walk through the trails in Lower Hume or take the kids to the new adventure playground next to the pool. Hume Park is great fun. Open on fair weather days from 1:15pm-8pm. Grimston Park wading pool – Open from 12-4pm in July & August, this is one of the few remaining free, public wading pools in Metro Vancouver. Staffed by a lifeguard, who often brings water toys and may offer face-painting if you are lucky. Grimston is a lesser-known park in New West, located in the West End a short walk from 22nd St. SkyTrain. Free admission to Moody Park Pool & Hume Pool on weekends, and just $2 for adults / $1.50 for kids and seniors during the week. The not-so-“secret” beach in Queensborough is a lovely and quiet little patch of sand. You probably don’t want to go swimming in the fast-moving Fraser River, but you can cool your feet at the river’s edge and benefit from the cool air off the water and surrounding shade trees. Located off the Port Royal Riverfront Walk, on the Poplar Island side. The Pier Park Urban Beach is accessed via the Quay boardwalk and a new pedestrian overpass at 4th Street (via the Parkade). While you can’t go swimming here, it’s breezy and beautiful, with trees and sun umbrellas for shade and even hammocks to relax in. The City is adding new water ‘misters’ to provide some relief from the heat (should be complete in the second week of July). Our family’s favourite swimming beach near New West is Centennial Beach at Boundary Bay Park in Delta, which is about a half-hour drive away. It’s a long, sandy beach with shallow water that heats up to the temperature of bathwater. When the tide is in, you can go out wading until you are just a tiny speck on the horizon and still not be more than waist-deep. When the tide is out, the area is full of tidepools to explore. There is a playground and concession near the main parking lot, but if you are willing to walk a ways you can usually find a quiet spot in the seagrass where you can spread a picnic blanket. Just remember to bring lots of sunscreen and your own shade: it’s mostly scrub bush and grass out there rather than trees. Sasamat Lake’s White Pine Beach is 40 minutes away and features a beautiful beach surrounded by mountains and tall evergreens. English Bay Beach in downtown Vancouver is 40 minutes by car or an hour by public transit. The beach is gorgeous, and you can pair your visit with a walk around the Stanley Park Seawall or a bit of Robson Street shopping in the West End. What about you? Where do you go to cool off on a hot summer day?